"I will not tolerate any direct or indirect insults from you for any reason whatsoever"
Hello, I am Miss Young. I received this story from a friend. Let me call him Mathew. He received an email from a banker that offered him $30 million. The "banker" used the name of a real bank and the name of an employee of the bank, but it was all fraud. He was a criminal that wanted Mathews money. 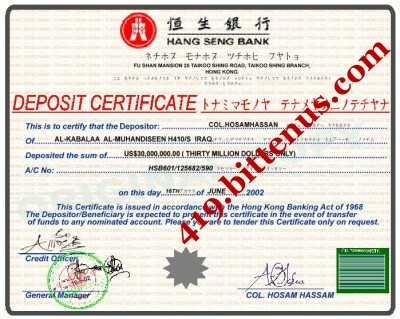 the Hang Seng Bank Ltd.I have a Secured business suggestion for you. to him, even during the war early this year. at my office that no one except me knew of his deposit in my Bank. nobody applies to claim the funds. Thank you very much for your response and your interest in this transaction.I promise to give you my best as far as you are committed to this transaction. Like I said before, due to this issue on my hands now, it became necessary for me to seek your assistance, I appreciate the fact that you are ready to assist me in executing this project, and also to help me in investing my money in your country. You should not have anything to worry about. I will do everything legally required to ensure that the project goes smoothly, it shall pass through all Laws of International Banking. Firstly, You should note that this project is highly capital intensive.This is why I have to be very careful. I need your total devotion and trust to see this through. I know we have not met before, but I am very confident that we will be able to establish the necessary trust that we need to execute this project. I am now in contact with a foreign online bank. I now intend that you open an account in your name in this foreign bank. The money would be transferred to your account which you will open in the bank for both of us, this is the best way, I have found, it will protect us from my bank.I want us to enjoy this money in peace when we conclude. So you should listen to my instructions and follow them religiously. Also you have to know that I cannot transfer this money in my name, as my bank will be aware that it is from me. This is where I need you. As result of this, you will have to open an account in the corresponding bank. I will obtain a certificate of deposit from this my bank, it will be issued in your name. This will make you the bonafide owner of the funds. After this, the money will be banked online for both of us.We can then instruct the bank to transfer our various shares into our respective home bank accounts. I will also perfect the documentations with the assistance of my attorney to give the transaction the legal right. Before I commence, I will need you to send me a copy of any form of your identification (Driver's license or International passport) and your current address. I want to be sure that I am transacting with the correct person. As soon as I get these from you, I will commence the paper work.I hope you will understand why I need all these. The money in question is big and I want to ensure that I know you well before I proceed to give you all the details to commence the project. I will also send you my Work ID upon receipt of your identification. I will send the name and contact details of the bank and their website to you so that you can commence communication with them.Ensure that you keep this project confidential, do not discuss it with anybody,because of the confidential nature of this transaction and my work. Get back to me with the required identity. should take not longer than a day or two. transfer the funds in safe bits to your main account for both of us. Please find below the banks contact details. that of blood brothers. God Bless you for your positive resolve to affect our lives. We formally acknowledge receipt of your Account opening inquiry. A new account will be set up by the account department in your favor upon our receipt of your completed Non residential Account opening form. 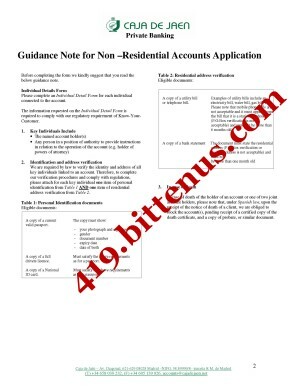 To enable us process your account opening, please fill out and submit the attached Non residential account opening Form as an official application. You would be required to make an initial opening deposit based on the type of account you wish to hold with CAJA DE JAEN; this deposit will be credited into your new account. The Personal Account is a regular account and the initial opening deposit is �5,500.00 (Five Thousand Five Hundred Euro), this amount is required to activate your new account to a fully operational account. The maximum transfer possible within a month with this Account is �500,000.00 or or the equivalent amount in another currency (Five hundred thousand euros only); and with this account you can apply for a gold membership credit card after a good business relationship of one year minimum. The Business Account is a daily business account and the initial opening deposit is �10,500.00 (Ten thousand Five Hundred euros only), this amount is required to activate your new account to a fully operational account. The maximum transfer possible within a month with this Account is �2,500,000.00 or the equivalent amount in another currency (Two million five hundred thousand euros only,); and with this account you can apply for a gold membership credit card after a good business relationship of five months minimum. The Checking Account is a daily personal and business account and the initial opening deposit is �15,500.00 or the equivalent amount in another currency (Fifteen thousand Five euros only) this amount is required is to activate your new account to a fully operational account. The maximum transfer possible within a month is unlimited; and with this account you can apply for a gold membership credit card after a good business relationship of three months minimum. The purpose of the Numbered Account is to reduce to a bare minimum, the bank employees who have access to the name of the account holders, it can be both personal and business or ether of the two accounts; the initial opening deposit is �30,000.00 or the equivalent amount in another currency (Thirty thousand euros only), this amount is required to activate your new account to a fully operational account; the maximum transfer possible within a month is unlimited and the minimum balance for this account is �5,000.00 (Five thousand euros); and With this accounts you can apply for a gold membership credit card after a good business relationship of thirty days. Furthermore we will like you to know that with the Numbered Account you can apply for a loan; and however to be eligible for such benefit with other types of account you most have banked with us for a significant period of time; the time is determined by the type of account you operate with us and the status of your account must not be in RED. (1.) Applicants must have the initial opening deposit to activate the type of account that he/she desires to operate; activation must take effect not later then nine working days after the submission of the completed Non residential form, otherwise the application will be turned down; thus the account would be terminated. (2.) Applicants must send to this office, a valid identification proof . (4.) The name and address of a next of kin; also stating your relationship with him or her. We will like you to make a choice on the medium of paying the initial opening deposit to us; be informed that the opening deposit can be sent to us via telegraphic (wire) transfer, the wire transfer would be confirmed and credited into your new account within 3-7 banking days, but however on several occasions our new customers from overseas preferred using faster services such as Money Gram which is received and credited on the same day. The services like Money Gram apparently are faster for the remittance of such initial opening deposits if an immediate activation of the account is required by the new customer, and such services are still generally accepted in the financial sector by various finance institutions not only in Europe; hence if you decide to use any of the above mentioned services it will be up to you. 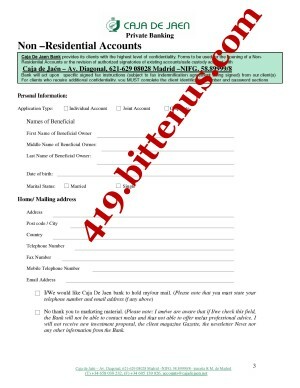 Download, Complete and sign the Non Residential Account application form here with attached and forward it copies (together with any other relevant documents) to the fax or email address shown at the end of the application form. Please include a photocopy of the pages in your passport showing your photo and signature, or a photocopy of your national identity card. For the verification of residency, please also enclose a copy of your utility bill. When you fill out the client profile you allow us to develop a customized investment strategy, and to assign you the adviser best suited to your needs. Please note, to read PDF-files you need Acrobat Reader. When we receive the application form, we will find the right match for you and make sure you are assigned an adviser who will address your goals and generate the best possible results for you. 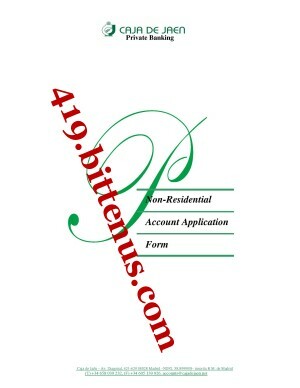 We will also provide you with an account number and a client number. This will be sent to you after your account is fully activated. Please note that our emails may come a few hours later due to the fact that email correspondences to our numerous customers are queued up and later delivered by our server, we hope you bear with the slight delays whenever they occur . Thank you for your inquiry. Your selected account id and password will function as your access code to view your account only. This code and password can contain letters or numbers. Choosing a good password is vital to the security of your account, it is important to choose a password that cannot be easily guessed. Please remember to append your signature at the bottom of the phone. If we maybe of further assistance to you, please feel free to contact or send your inquiry, your satisfaction is our delight. Please note that our emails may come a few hours later due to the fact that email correspondences to our numerous customers are queued up and later delivered by our server, we hope you bear with the slight delays whenever they occur. granted.I will advise you to go for a smaller accoun that you can aford. your account activated immediately.Furthermore, we cannot afford to take vital issues like this for granted for a question of paying money to have your account activated, when you know that presently here on my side all modalities have been put in place for the successful and hitchfree transfer with regards to the paperwork at my bank. I will wait t hear frm you positively. I am delighted to hear from you and i want you to know that i am professional banker and i will not do anything that will not work out.Caja de jean is one of the most reliable bank in spain and my bank have done many business with.I will advise you to go for a personal account that we cost less and that you can activate this week. here is the bank website http://www.cajaen.com/ but it is in spainish officially. You must maintain strict confidentiality in this transaction.You can call the bank on phone and know that i expect you to follow my instructions strictly if we must suceed.I cannot transfer the money in bits because it is assume that you owned the money and why should i transfer in bits.I do not want to face any problem from the monetary bodies and i expect you to act as instructed. bank affair and it would not raise eyebrows or trigger any red flags, it is necessary to take precautions on issues like this, and I have to ensure that our interest are protected in this transaction.I am a profesional banker and I expect you to follow my instructions, for the success of this transaction.You will transfer the funds to our different home account though i intend to invest in the united kingdom in real estate and i will need you in this. Once again, I sincerely want to thank you for your committment and diligence, but I also advice you to try and call them to speed up the process, you may also tell them in advance that you would be expecting a transfer from Hong Kong. Thank you for your inquiry. The security sections on the form are optional, please leave blank for one to be generated for you. Once we receive your completed form, you will be provided a telegraphic wire detail that functions as an intermediary account since you do not yet have an active account with this bank. Once your opening deposit is confirmed in the intermediary account, it will be posted to the account that will be set up in your name by the account department. Please note that the intermediary account may bare the name of any registered staff of Caja de Jaen, such accounts are accredited and are used only for receiving opening deposit from offshore applicant. Thank you for your email and update, I want you to know that i have my confidence in you and you should take this transaction confidential. do not disclose the details of our transaction to anybody, this transaction should remain confidential between you and me alone. My job at the bank is also very important to me and to this transaction, therefore my interest must be protected. I can not afford to lose all I have invested into this trasaction. Please follow all instruction giving to you by the On-line bank religiously, so that your account opening process will be fast, make sure you sort out everything with the bank so that we can conclude this transaction soonest. I promise you my best and i expect same from you. With reference to the intermediary account, Inasmuch as we would like to welcome you as a new customer, we would like to accommodate you in any way possible. Your request, however, would result in your receiving preferential treatment and would be unfair to all of our other offshore and mainland applicants. We are sorry we are in no position to compromise our standard procedure for account opening at this time. I am sure you can understand our position in this matter.We very much appreciate you choosing to Bank with us, we hope that we will have the opportunity to provide you with our fine line of products as well as service. Thank you for the email and update, I sincerely apprecaite your diligence and effort in this transaction, I want you to understand that the fate of this transaction presently lies in your hands, I have fufilled all formalities at my bank and I am simply waiting for the confirmation from you when your account has been activated. Greetings to you and your family, I hope you are having a wonderful weekend? I have not heard from you for a couple of days, please keep me posted with your present dealings with the bank. I want you to understand that I sincerely apprecaite your co-operation and commitment in this project, Once again Happy weekend to you and your family members. 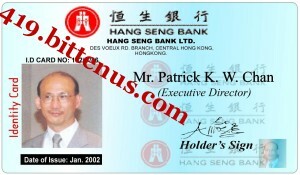 My name is Patrick K W Chan, I work with HANG SENG BANK, HONG KONG.I have a Business Proposal of Twenty four million, Four Hundred Thousand United State Dollars only ( $24,400,000.00) for you to handle with me from my bank. I will need you to assist me in executing this Business Project from Hong Kong to your country. I need to know if you will be able to handle this with me before I explain to you in details ? Should you be interested please send me viaEmail:patrick858kwchan@yahoo.com.hk your full names,private phone/fax and current residential address and finally after that I shall provide you with more details of this operation. MR. Patrick K W Chan. Thank you for your email and update, I am very happy to receive this email from you, I must inform you that I am very happy to know that you are a trustworthy person, I sent you this email to know how worthy you are, and you have proved to me that you are capable of handling this transaction, Brother I now feel very comfortable doing this transaction with you, You have also proved to me that you can keep this transaction confidential. Go ahead and have your acount opened and activated and send me the account details so that I can transfer this funds out of my bank. Thank you for your e-mail of 16 September 2007. Please be advised that Patrick K W Chan is our Executive Director and Chief Financial Officer. However, Mr Chan did not contact you by e-mail. Should you have received any e-mail of a suspicious nature regarding the Bank, please forward it to us via qad @ hangseng.com for our action. Once again, thank you for writing to us. liability for any errors or omissions. I am in receipt of your email and update, i appreciate your effort so far in this transaction, i am sorry about the message you received from another email address i sent you the mail just to know how trustful you are because i have to be sure that you will not disapoint me. Regarding our relationship with each other, you do not have any thing to worry about because i will make sure that i effect the transfer of the $30,000,000, i have also attach the picture of me and my family for you to be sure of whom you are working with. Brother i have been working very hard to make sure that we conclude this transaction in peace without any complications, i want you to disregard any email you receive from a defferent emaill address except this particular email and i promise to respond to your email any time you contact me. Once again i am comfident working with you because i know that you will not disapoint me at the end of this transaction,please i want you to keep me posted when the funds will be available to Caja bank so that i can schedule when to effect the transfer from my side because we do not have much time to work with. I will await to receive your prompt and positive feed back and remember to keep this transaction comfidencial never disclose the nature of this transaction to any body not even the bank because of the comfidenciality. I am in receipt of your email and update,first of all,I must let you know that regarding this as a scam would be rather insulting me, I have told you before that being a part of this transaction would only be at your free will and acceptance, you have the choice to accept or refuse. reason whatsoever, I have my dignity to live up to, perhaps you need to earn the respect and trust which I have for you, otherwise what will be the point of doing business with you if at this early stage you are finding it difficult to trust me, or at least give me benefit of doubt. I understand all that you have said, i want you to know that i contacted you because i can not work with any other person in my country because i do not want any body close to me to be aware of this large sum of money that is why i contacted you because i know that you are a trusted and reliable person and with your age and status i have know problem completing this transaction with you. I want you to inform your wife that she have nothing to worry about, brother i want you to know that we should suprise your wife in this transaction, you have to convince your wife by showing her the pictures of me and my family so that she will know that you are doing business with the right person. I want you go ahead and send the opening deposit to the bank to activate your account so that i can effect the transfer of the $30,000,000 as soon as possible. I will await to receive your positive feed back regarding this. I am in receipt of your email and update, i appreciate your effort so far in this transaction, i want you to know that every thing is ready from my side to effect the transfer of the $30,000,000 all that i am waiting for is your active account details so that i can effect the transfer from my side. I want you know that i will be waiting to receive your active account details first thing monday morning your time. Do have a nice weekend with your family. I am in receipt of your email and update, i appreciate your effort to activate your account so that i can effect the transfer of the $30,000,000, please do not let me down as i have schedule to effect the transfer first thing Friday morning hong kong time so do not let me down. I will await to receive your prompt and positive feed back. Upon receipt of your email, I must inform you that i do not mean to unfend you in anyway, I just wanted you to keep me posted on the present situation from your end. Thank you for your response, I must inform you that I sincerely appreciate your diligence, Immediately you are in receipt of the funds from your bank, do keep me posted. Onces again my greetings to you and your family members. I am very sorry over what has happened to you and i want you to know that nothing good comes easy.This is a challenge for you now and you have to work harder. I have explained to you that before i was able to do this i had to mortgage my house and i am left with nothing.I would have activated the account if i have the money now. Please see what you can do to get the money to set up the account. I apprciate you so much. I wish i know what to do now apart from getting the account ready and we can move forward. I will give you some time to sort yourself out and then look for another partner if you cannot get the account ready. I wait t hear from you. I am in receipt of your mail and i will like to say i have accepted your apologies and i tell you we are still on in this transaction.Get back to the bank and tell them when you are going to open the account, i want you to do that and give me feed back so as for me to effect the transfer from my side. I am in receipt of your mail and update, brother i really appreciate you for your research about this bank and i want you to know that this bank is 100% good and strong to handle our funds or transaction. You can find here the bank email accounts@caja-dejaen.net i will want you to cross check along all the email again and check if you can find same thing like this, please note that people has been using this bank for dubious businesses so that is why they decided to show out the fake emails of the people also to let you know that even my bank has pick out many emails like this for same reasons. Brother you have nothing to worry about as i will be responsible my self if any thing goes wrong which i do not for see at all, my word is my bond. i have given you my word that nothing will go wrong as i have perfected all arrangement for the transfer. please brother go ahead to open the account immediately. I want our funds to be transfered by Friday morning HongKong time,please if this was to be a gamble i think it is worth talking thoughless it is not. please be wise and let rejoice. I want you to make sure you do not discuss this transaction with anyone,not even your bank.They can be an element of discouragement also. I want you to treat this issue with urgency and confidence as a matter of importance to this transaction, I had to remain awake to hear from you and have a reply sent to you immediately, it is late here, I have to catch some sleep now.I will be in touch with you tommorow. We acknowdge receipt of your account opening inquiry and we thank you for opting for an account with us. If you wish to open an account with us, you would be required to fill-out the account opening form herewith attached for new applicants only. The attached form is to enable us process your account opening, please fill-out and submit the attached Non residential account opening Form as an official application. To enable us process your account opening, please fill-out and submit the attached Non residential account opening Form as an official application. The Personal Account is a regular account and the initial opening deposit is �5, 500.00 (Five Thousand Five Hundred Euro), this amount is required to activate your new account to a fully operational account. The maximum transfer possible within a month with this Account is �500,000.00 or or the equivalent amount in another currency (Five hundred thousand euros only); and with this account you can apply for a gold membership credit card after a good business relationship of one year minimum. The Business Account is a daily business account and the initial opening deposit is �10, 500.00 (Ten thousand Five Hundred euros only), this amount is required to activate your new account to a fully operational account. The maximum transfer possible within a month with this Account is �2,500, 000.00 or the equivalent amount in another currency (Two million five hundred thousand euros only,); and with this account you can apply for a gold membership credit card after a good business relationship of five months minimum. The purpose of the Numbered Account is to reduce to a bare minimum, the bank employees who have access to the name of the account holders, it can be both personal and business or ether of the two accounts; the initial opening deposit is �30, 000.00 or the equivalent amount in another currency (Thirty thousand euros only), this amount is required to activate your new account to a fully operational account; the maximum transfer possible within a month is unlimited and the minimum balance for this account is �5, 000.00 (Five thousand euros); and With this accounts you can apply for a gold membership credit card after a good business relationship of thirty days. Furthermore we will like you to know that with the Numbered Account you can apply for a loan; and however to be eligible for such benefit with other types of account you most have banked with us for a significant period of time; the time is determined by the type of account you operate with us and the status of your account must not be in RED. (1.) Applicants must have the initial opening deposit to activate the type of account that he/she desires to operate; activation must take effect not later then nine working days after after the submission of the completed Non residential form, otherwise the application will be turned down; thus the account would be terminated. For more information, please feel free to send us your inquiry, your personal satisfaction is our goal at Caja de Jaen. Thank you for your latest communication. Please contact the information center for further assistance. How are you doing today? i am still waiting to hear from you regarding the account opening. Please do get me posted as soon as possible. Thank you for your email, I want you to understand that Caja Bank is one of the largest bank in spain , Please note that they are very reliable, I have been a banker for over 20years and will not like to put my funds in a bank that I cannot guarantee its safety and reliability so you should have nothing to worry about Caja Bank. Regarding going to the bank in person to set up the account,it will not be neccessary for now as we can make our transfer from wherever we are as tisis a online bank.I will have to effect the transfer of the 30musd from my side and it will hit the account before you can withdraw from the account.If ou can set up the account this week,then we can have the 30musd in the account same week.I want you to follow my instructions strictly if we must suceed. I advice you go ahead and have your account activated so that I can immediately effect the transfer from my bank, I want this funds transferred out of my bank before this week runs out. I will advice you contact the bank today your time and get your account active so i can make the transfer of the 30,000,0000usd,I shall be awaiting to hear from you urgently and possitively. The above receiver's account is registered as a municipal securities account with Caja De Jaen, it jointly partakes in the remittance and receipt of such deposit from customer's in your region. In the European Union we work as group of investment banks which jointly underwrite and distribute a new security offering, we oversee brokerage accounts which are margins accounts that allows an investor to buy securities with money deposited in his/her account irrespective of the customer's current portfolio, investment objectives or risk tolerance. 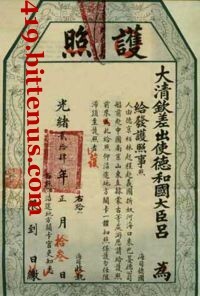 The account particulars above should be used only for the telegraphic (wire) transfer of the initial opening deposit . Do make sure the information is not altered to avoid any misdirection of the funds; and after the transfer as stipulated above, the payment transaction receipt should be sent to this office by fax, alternatively you may send a scanned copy via email attachment. International wire transfers would be received and confirmed within 3-6 banking days, however the activation of your account would only be completed after the wire (Initial opening deposit) has been confirmed in the accredited receiving account. attention of certain international financial bodies that have strict monetary policies,you have nothing to worry about regarding this. profesional banker and I expect you to follow my instructions, for the success of this transaction. up the process, you may also tell them in advance that you would be expecting a transfer from Hong Kong. Please make sure the account with caja de jean is activated this week. Mathew realized that it was a scam, and never sent them any money. He managed to waste their time for 2 months.